OK, you’ve decided to get in shape. Congratulations. Research now shows that, to prevent many health problems, daily "physical activity" (eg., household chores) is enough. Tasks like vacuuming, raking, sweeping, and mowing the lawn count as effective physical activity. And, like saving loose change, small amounts throughout the day add up. For example, blood pressure increases as we age. Concomitantly, the risk of a cardiovascular event increases as blood pressure rises above 115/75 (JAMA May 21, 2003). But a simple brisk walk 20-30 minutes per day, 5-7 days per week, can lower high blood pressure (Moreau KL, et al. 2001), or possibly prevent it from ever developing (Hayashi T, et al. 1999). So, it doesn't take much exercise to prevent health problems. 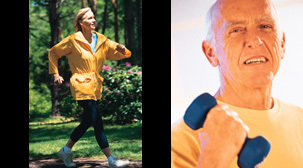 This topic is discussed in detail in: "Exercise Guidelines for Health: Official Recommendations". No, you won’t "get in shape" by doing this, but being more active will lower your risk of cardiovascular disease and may help you lose a little weight. Knowing that you don't have to join a gym and run on a treadmill 30 min/day multiple times per week removes the psychological burden. So, make a lifestyle change. Then, stick with it long enough until it becomes a habit! Don’t hide behind the excuse that you don’t have time to exercise....adjust your attitude and make exercise a priority in your weekly routine. Think about this: you may not have time to lie around in the coronary care unit either but if you have a heart attack, you won’t have any choice on that one! Instead of ignoring your health, take a critical look at how you spend your time. Be honest, do you really need to watch that TV program? If so, you could free-up some time by recording it and then fast-forwarding through the commercials when you watch it. You might even find that the program wasn’t that important to you and not watch it at all. Chances are, there is something you can eliminate from your weekly routine that will provide the 45-60 minutes you need. Or, you can turn a daily chore into an exercise session. For example, convert the task of walking the dog into your daily run and take the dog with you. But, don’t cheat on your sleep time when adding exercise into your daily routine. Remember, each day really begins with a good night’s rest. Not many people can sustain a schedule of getting up at 5AM to go for a run before work. If you do decide to do this, make sure you go to bed earlier. Even if you have a busy travel schedule, you can still exercise when you're on the road. Buy some simple exercise aids (jump rope, stretch bands, heart rate monitor, running shoes, etc.) and carry them with you when you travel. These items are small and you can put them in your luggage. 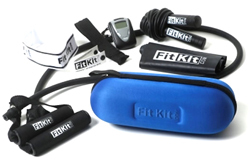 We also like the FitKit. In addition, most hotels and even some airports now have fitness centers. And there are web sites available that allow you to find them. See our review: "Exercise Tips for Travelers." Use a calendar to keep track of how often you exercise. Put a star on the days that you exercise and put a zero with a line through it on the days that you don't. As the month progresses, you'll have a visual reminder of how well you're doing. Put your fitness goals in writing; often, doing this crystallizes your commitment. Tape a note on your refrigerator or the mirror in your bathroom. Seeing it every day will help keep you focused. In addition to identifying a specific fitness goal, make sure you also target a specific date to achieve that goal. Tell someone what your fitness goal is. This may also help to hold yourself accountable. Allow yourself one work-out per week with no expectations (ie., forget about your performance goals on that day). Just work-out for fun. If your running is boring you, find new routes; focus on observing your surroundings and try not to think about your body. Listen to your favorite music while exercising. A major factor in keeping yourself motivated to exercise is finding something that you really like to do. "Behavioral activation" (BA), a new form of cognitive behavioral therapy, is based on the principle that an active lifestyle promotes more robust mental as well as physical health. "We are realizing that people are far more likely to stay with an activity if it matches their personality," says Professor David Veale, MD, a psychiatrist in London in his 2015 book, Manage Your Mood (Robinson), a consumer handbook on BA. Veale's exercise guru is Jim Gavin, Professor of Applied Human Sciences at Concordia University in Montreal and a pioneer of lifestyle fitness coaching. "Finding our perfect personal fitness pursuit will not only help people with health and fitness, it will also help us to grow personally," Gavin says. Many of his clients "transform their lives by finding a fitness pursuit they love and therefore stick with." The key to loving exercise, it seems, is to know your own personality traits. Is your strongest trait sociability? Spontaneity? Aggression? Competitiveness? Are you internally or externally motivated? Focused or unfocused? Risk-seeking or risk-avoiding? These factors, according to Gavin, most affect our ability to persist in exercise. For example, says Gavin: "If you like to socialize, go for tennis rather than weight training. Or, if you're shy, you're more likely to be successful with yoga than racquet sports." This topic is discussed in greater detail in "Exercise Motivation Part 2: Psychology". • Biking/Running/Triathlon Events: Check your local newspaper, the web site of the nearest big city, or go to www.Active.com for events in your area. Competing in these events generally doesn’t cost that much, and often you get a free T-shirt. 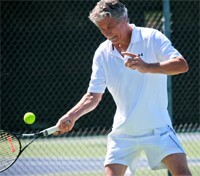 • Tennis Tournaments: Tennis leagues exist in every city and nearly every tennis club and public park. For most, you can just sign-up; for others, you may need to have a pro give you a USTA ranking. Generally, this only requires you to hit with him/her for a few minutes. • Track & Field Meets: Did you know that there is a diverse schedule of well-organized track meets around the country that you can compete in? Check out the web site www.MastersTrack.com to find a meet in your area. • Walking: Walking is one of the best forms of exercise for most people. Look in the newspaper for fund-raiser walk-a-thons or for organized group walks. The American Heart Association holds "Heart Walks" in most major cities. For some, hiring a personal trainer is what they need to stay on-track and stay motivated. Just knowing that you have regular appointments to keep may do the trick. For tips on selecting a personal trainer, refer to the related story "How to Choose a Personal Trainer". If you don't want to join a gym and hire a personal trainer, then surround yourself with other people who exercise regularly; develop social circles based on exercise (walking in the mornings, bike trips on weekends, tennis leagues, etc.). Find a partner. If you arrange to meet someone at a specific time and place, you will be more likely to stick to your exercise routine. And, it helps if you and your exercise partner have similar interests and comparable fitness levels. It won’t be much fun if your partner is way ahead of you while running or biking, or if he blasts winners by you on the tennis court. For more ideas on finding someone to exercise with, see: "Find An Exercise Partner". • Beeminder (www.Beeminder.com): This tool displays your results on a yellow brick road graph. Veer off course and you pay a fine. • Healthy Wage (www.HealthyWage.com) is a result of a collaboration of corporate and government sponsors to motivate people to lose weight. You win money if you reach your goal. • stickK (www.stickK.com): Probably the most well-known, stickK was launched in 2008 and has been profiled on major TV networks and in major publications. Fail to meet your goal? You pay the fine you set for yourself. These are discussed in detail in Part 2. And if you'd like still more tips, here is a list from 100 trainers from around the world, including Beth Shaw (YogaFit), Tony Horton (P90X), and others: Exercise motivation tips from 100 trainers. 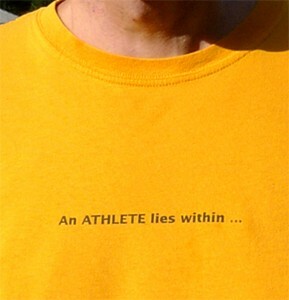 Remember, there IS an athlete inside you. So, get out there! Part 2 of this discussion can be found here: "Exercise Motivation Part 2: Psychology"
"Exercise Guidelines for Health: Official Recommendations"